Are you always in a hurry and wasting a lot of time to find keys or phone? Does your the elderly forget about the remote control at home? Is your kitty or puppy playing hide-and-seek and you do not know where it hides? 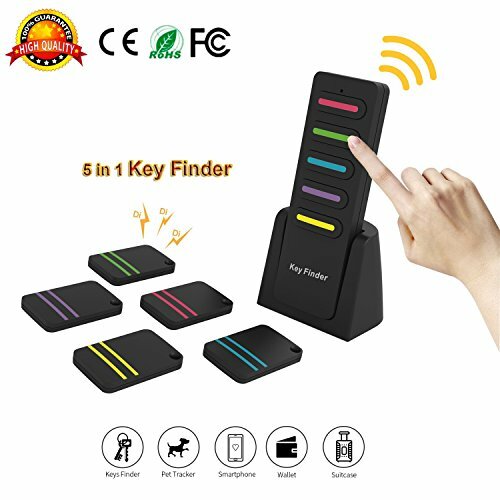 So if you have wireless key finder, you can find the lost immediately. ❤Best gifts for everyone, It is so useful in daily life that nearly all people may need it. How do I attach receivers to my items? It comes with 5 key rings and 5 double sided tapes for you to attach to keys or any other items. Will different sets work with each other? If you purchase multiple units of the same model, the transmitters will activate all corresponding color-coded receivers. It depends on how frequently you use it. A standard CR2032 battery lasts about 6 months. When the sound is weak, you could judge if it should be replaced. 1. Open the outer shell with the opening tool procided. 2. Replace CR2032 battery. Please mind the polarity of battery. 3. Close the outer shell. 1. Remove the battery door located on the back of the transmitter. 2. Install the batteries according to the (+) and (-) marks inside the battery compartment. 3. Push the battery door back into place. ❤ Any issues with this WIRELESS KEY FINDER, Pls feel free to contact us, We will try our best to give you a great service ! 【ONE KEY TO FIND & SAVE YOUR TIME】- With just one press on the button of the transmitter, the beep sound from the key finder(receiver) will lead you to locate and find the lost item,can quickly and conveniently find your phone, keys, wallet,or your pet,when you are in a hurry. 【BEEPS and FLASHES】- Press on the according button, up to 80dB loud beep sound and flashing red LED light will lead you to find lost items up to 100 feet away in seconds. 【PERFECT DESIGH & SMALL LIGHTWEIGHT】- With modern Apple's design,and the receiver is very thick. you can attach it in your purse or phone, it will not take up the space. The base can be installing on the wall or the back of door, also can be place on the table. 【EASY TO INSTALL】- Detachable transmitter bracket, not only can pur it on the desktop, but also can be a MULTITASK MANAGEMENT. The key finder (5 colorful receivers) can be attached to key, mobile phone, wallet and luggage etc. almost all the important items. 【LOW CONSUMPTION and LONG STANDBY TIME】- With 6pcs Long Life Replaceable CR2032 Battery (More than 6 months standby). CE, RoHS, FCC approval. Free Lifetime Technical Support and 24 Months Replacement Warranty from US. If you have any questions about this product by LOBKIN, contact us by completing and submitting the form below. If you are looking for a specif part number, please include it with your message.